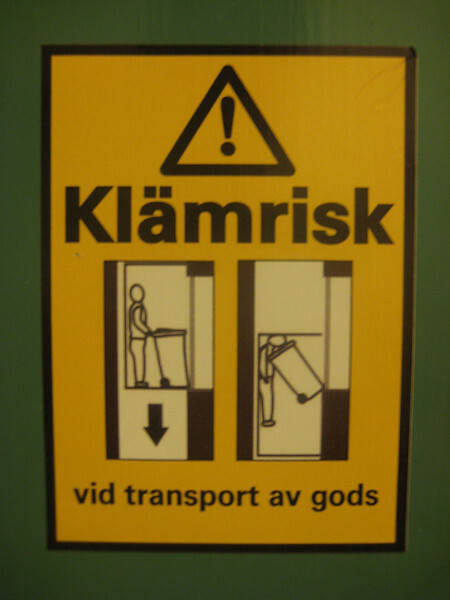 Sweden from the Cheap Seats: Don't take that elevator! JoeYou know, it's the little things that take the most getting used to. Like elevators, for example. Sure, there are elevators all over the place here, but they're, I don't know, different. For one thing, most of them don't have any memory. You hit a button, and they go where you want them to, but if you hit another button in the meantime? Nothing. Or you're waiting for an elevator and you press a call button, but someone's already using the elevator, so the button doesn't even light up. You have to wait until it's done with what it's doing, and then you can call it. Is this really important in my life? No, but I spend a lot of time ruminating about it nonetheless as I wait for elevators. Wow,that's the most morbid warning poster graphic I've ever seen.